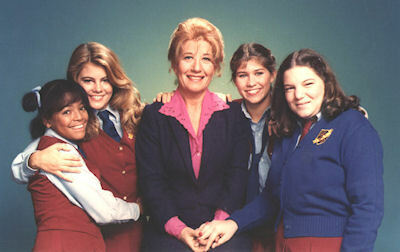 Effective starting tomorrow (April 3), The Facts of Life will be off of the TeenNick schedule. The '80s comedy was airing weekdays at 7am since March 12, but after just 16 airings, TeenNick has pulled it from the schedule. But that doesn't matter really, because if you get The Hub, you can watch The Facts of Life starting tonight in primetime Sun-Thurs at 9:30pm and an encore at 3:30am, as we mentioned. I guess you really do take the good, and take the bad, and there you have The Facts of Life! Facts of Life is being replaced by Big Time Rush in the half-hour, so now that series will be back to the full hour. We hope Blair, Jo, Tootie, Natalie and Mrs. G return to the schedule soon, but at least you can still watch them on TV starting tonight on The Hub. One other schedule change of note for TeenNick is Full House being added to weekends at 11:00pm & 11:30pm starting April 7, replacing Malcolm in the Middle. That comedy will remain airing in the 4am hour on weekends though, so all is not lost. Full House will also continue to air every morning from 5-7am. Stay with us of course for any further updates. MeTV Network announced affiliation agreements with Grant Broadcasting-owned WLAX/WEUX, LaCrosse/Eau Claire; WZDX, Huntsville; and KGCW Davenport. WLAX/WEUX, LaCrosse/Eau Claire launched on January 12, 2012 and carries MeTV Network over the air on channel 25.2 in LaCrosse and channel 48.2 in Eau Claire. WZDX, Huntsville will launch on Tuesday, April 17, 2012 and will carry MeTV Network over the air on channel 54.3. KGCW, Davenport will also launch on April 17, 2012 and will carry MeTV over the air on channel 26.3 and simulcasted in the same market, KLJB, Davenport will launch on the same day and will carry MeTV over the air on channel 18.3. These additions and other signed affiliation agreements will bring MeTV Network's clearance to more than 77% of the country. MeTV now has more than 120 affiliates. Stay with us for further clearances as we hear them and of course if there are any new programming announcements & schedules.